Influenza is a respiratory illness caused by influenza viruses. It typically appears 1-4 days after the initial infection, with fever, chills, muscle aches and fatigue common. Cough, sore throat and runny nose are also seen. In children, stomach complaints are frequent. On its own, the flu can be nasty. But it can complicate into viral pneumonia, or lead to a subsequent bacterial pneumonia. And if you have other chronic illnesses, like heart failure or asthma, it can cause significant worsening of these conditions. Influenza infection rates are highest among children. Serious illness and death is most common in the very young (under 2 years) and older adults (65 years and older). Seasonal influenza causes annual winter epidemics, which can vary in severity. It’s difficult to predict their severity or timing in advance. Influenza viruses are grouped into two types. Influenza A viruses are categorized based on the types of protein on their surface. 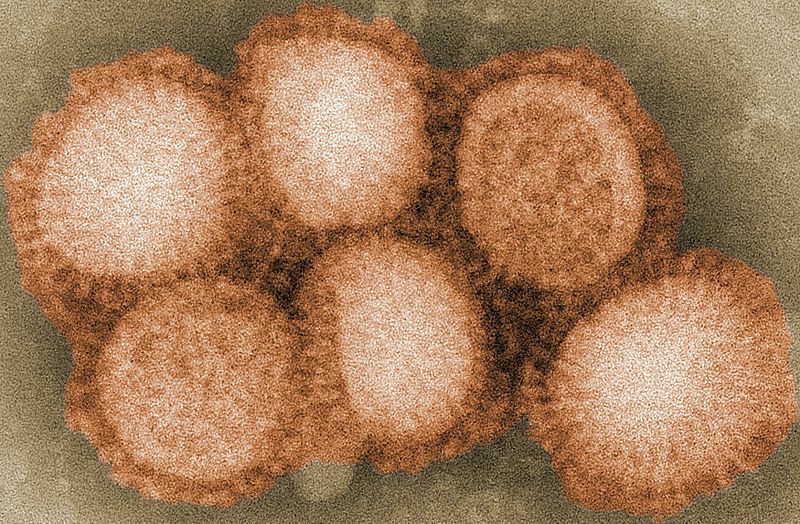 For example, the most predominant virus circulating in Canada at this time is called “A/H3N2” This is an influenza A virus with an H3 hemagglutinin and an N2 type of neuraminidase. Influenza B viruses are quite distinct from influenza A viruses, and are divided into two types, “B/Yamagata” and “B/Victoria”. What happened last year, with H1N1? The H1N1 pandemic completely dominated influenza infections in Canada last year, with few other strains identified. The virus started circulating in Canada in April 2009 but then almost disappeared, returning in September and peaking in October/November. Infections dropped off significantly in mid-December. There were 2769 outbreaks reported in 2009/10, the vast majority (95.4%) occurring in schools. (In schools, an outbreak is defined as greater than 10% absenteeism due most likely to ILI. For the majority of Canadians, the H1N1 illness was easily self-managed without serious problems. Some did experience more severe consequences. The risk of hospitalization was significantly increased among those with underlying medical conditions, those that were pregnant, and those of Aboriginal status. There were 8678 confirmed H1N1 hospitalizations. 17% (1473) of these patients were admitted to intensive care, and 4.9% (428) died. The highest hospitalization rates were in children under the age of 5, and in that group, those <2 years old had intensive care rates higher than any other age group. The pandemic also hit pregnant women particularly hard, with the risk of being hospitalized much greater than non-pregnant women. There were 1300 hospitalizations of women of child-bearing age. In this group, 266 (20.5%) were pregnant, with 61% in their third trimester. Four deaths occurred among pregnant women. Influenza is a sneaky virus. It has the ability to mutate and thwart our own immunity. Dramatic changes in the viruses due to genetic shift can lead to pandemic infections, where there’s little immunity among the population. Where the match between the vaccine and the virus is high, vaccination prevents 70-90% of infections in healthy children and adults, and about 50% in the elderly. Vaccination also decreased the incidence of pneumonia, hospital admission and death in the elderly. In observational studies, vaccination reduces physician visits, hospitalization and death in high-risk patients <65 years old. While we do need to be cautious in interpreting observational data of non-specific outcomes, the data that exist suggest there is a benefit beyond simple infection rates. How is the vaccine formulated? The flu vaccine must be reformulated every year because of the “antigenic drift” within each strain. Estimates are made based on which strains are expected to circulate several months in the future. It’s because of antigenic drift that the vaccine is changed each year and must be administered annually. How does the vaccine actually work? Receipt of a flu vaccine causes an immune response to the H and N subunits of the inactivated virus. The degree of response depends on several factors included age, prior exposure to influenza antigens, and overall immune status. Antibodies to the H and N units are maximized about 2 weeks after injection. What’s in the 2010/11 vaccine? The technical answer is that this year’s vaccine contains the A/California/7/2009(H1N1-like, A/Perth/16/2009/(H3N2)-like and B/Brisbane/60/2008(Victoria lineage)-like antigens. What this means is the vaccine contains the H1N1 vaccine from last year, the B-vaccine component from last year, and a new H3N2 component. I had the flu shot in the past, including the H1N1 vaccine. Is there any evidence that repeated flu shots may impair my natural ability to respond to the flu virus? Repeated administration of the influenza vaccine has not been demonstrated to impair the immune response of the recipient to the influenza virus. What flu shots are available? Fluviral (manufacturer: GlaxoSmithKline) contains thimerosal buts does not contain any trace amounts of antibiotics. Vaxigrip (sanofi pasteur) contains thimerosal (in its multi-dose vials only) and trace amounts of the antibiotic neomycin. Single dose vials or syringes do not contain thimerosal. Agriflu (Novartis) newly authorized in Canada, it thimerosal-free but contains trace amounts of the antibiotics Kanamycin and neomycin. Influvac (Abbott) contains trace amounts of the antibiotic gentamycin. Unlike the other products, it is only approved for use in adults 18 years of age or older. The fifth product, Intanza (sanofi pasteur) is administered just under the skin. It contains trace amounts of neomycin. What vaccine will I be given by my physician/flu clinic? Fluviral and Vaxigrip are the two publicly-funded vaccines in Canada. Does the 2010/11 vaccine contain any adjuvants? Large cohort studies of health data bases have demonstrated that there is no association between childhood vaccination with thimerosal-containing vaccines and neurodevelopmental outcomes, including autistic-spectrum disorders. Similar large-scale studies have not specifically addressed prenatal exposure to thimerosal-containing vaccines in pregnancy. Despite the absence of data indicating any associated risk, influenza vaccine manufacturers in Canada are currently working towards production and marketing of thimerosal-free influenza vaccines. All of the injectable vaccines are manufactured using chicken eggs, which means the vaccine may contain traces of egg protein. People with serious egg allergies should not receive the vaccine. Serious adverse reactions to the influenza vaccine are rare. The most common side effect is soreness at the injection site for a few days, affecting 10-64% of recipients, and last less than two days. Fever is uncommon in adults but may be observed in children. Serious allergic reactions are possible, particularly to the residual egg protein that is in all vaccines. Guillain-Barré Syndrome (GBS) was associated with the 1976 swine flu vaccine. Since that time there has been extensive monitoring to evaluate if a causal relationship exists. Since influenza itself can cause GBS, and there are other causes of GBS, the incremental risk is the value of importance. The normal rate of GBS in the population has been estimated at 10-20 cases per million adults. Based on Canadian data the absolute risk of GBS appears to be one excess case of GBS per 1 million vaccinated. The potential benefits of vaccination greatly outweigh the estimates of risk for vaccine-associated GBS. In the 2000/01 influenza season there was an increased number of reports of red eyes, cough, wheezing, facial swelling and other breathing problems withing 24 hours of the vaccine. Termed oculo-respiratory syndrome, over 2000 reports were received that year. Symptoms lasted about 3 days on average. Further study revealed that this syndrome had been reported in the past, and in other countries, but not as frequently as 2000/01. A slight variation in the manufacturing process that year may have resulted in the increase occurrence, and its identification as a distinct reaction to vaccines. In subsequent years that has been a significant decrease in the number of cases reported. Having a case of ORS does not prohibit further influenza vaccination. The vaccine is recommended for all Canadians who don’t have a medical reason for not taking it. Even if you’re not in a “priority” group, vaccination reduces the risk of transmission to someone that is. There’s some observational data to suggest that vaccination provides indirect protection to others in the household/community. In Ontario, where a universal immunization program has been offered since 200o, beneficial impacts have been observed on deaths, hospitalizations, doctor visits and antibiotic prescriptions. From an economic perspective, the vaccine is considered an attractive health intervention. How many flu shots do I need? Flu shots are not recommended for infants <6months of age. Children 6 months to 8 years of age should receive two doses of the flu vaccine, if they have not previously received the flu vaccine (not including the H1N1 vaccine given in 2009) to achieve the required level of protection. A single flu shot is recommended for adults. A second shot in adults, even those with immune compromise (e.g., HIV, patients with organ transplants) does not significantly boost the immune response. National Advisory Committee on Immunization. Statement on Seasonal Trivalent Inactivated Influenza Vaccine (TIV) for 2010-2011. Centers for Disease Control and Prevention Recommendations and Reports. August 6, 2010 / Vol. 59 / No. RR-8. Morbidity and Mortality Weekly Report Prevention and Control of Influenza with Vaccines. Recommendations of the Advisory Committee on Immunization Practices (ACIP), 2010.